Sometimes we send emails that we wouldn’t want anyone but the recipient to read. They might concern big business deals. They might discuss personal problems you’d rather keep quiet. They might criticize people you’d never criticize to their face. With Gmail’s upcoming Confidential Mode, you don’t have to worry about those messages ending up in the wrong hands. 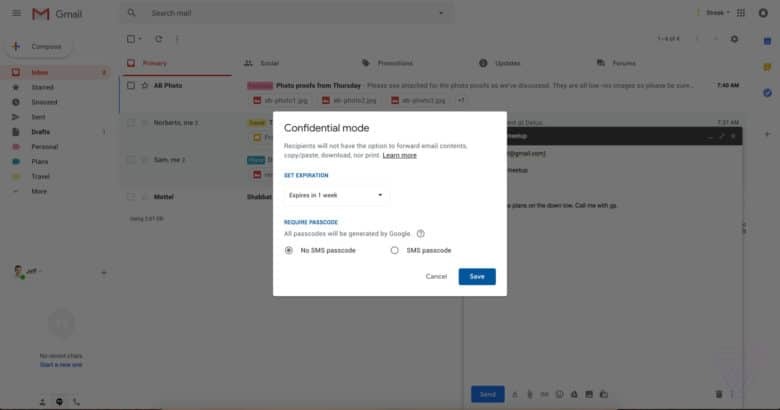 Confidental Mode “lets Gmail users stop recipients from forwarding certain emails, or restricts the ability to copy, download, or print them,” explains The Verge, which has obtained early access to Gmail’s big redesign. Google will also give Gmail users to protect messages with a passcode, generated by SMS, which will help ensure sensitive messages can only be opened by the intended recipient — even if someone else has access to their account. Finally, there will be an option to set email expiration dates. You’ll be able to specify how long your email sits in the recipient’s inbox before it is deleted automatically. Other new features coming with this redesign include Smart Replies and Snooze — two things currently only found inside Gmail’s mobile apps — and the ability to use other G Suite apps inside your inbox. The redesign is expected to feature during the Google I/O keynote on May 8, but according to The Verge, it could start rolling out to some users before then.